Santa Barbara author Shelly Lowenkopf, best known as the author of the popular The Fiction Writer’s Handbook, will read at Chaucer’s Books in Santa Barbara at 7:00 p.m. on Thursday, May 28. The event is free and open to the public. 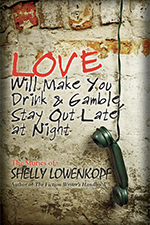 Lowenkopf recently won the Los Angeles Book Festival Award for Best Collection for his newest book, Love Will Make You Drink and Gamble, Stay Out Late at Night, a gathering of short stories. The book brings a number of Lowenkopf’s previously published short stories together in a single volume. All the stories revolve around life in Santa Barbara, the oceanside city north of Los Angeles, where people go after they’ve burned out in San Francisco and L.A. Yet there’s no safe haven anywhere. Interwoven into Santa Barbara’s picturesque setting, the people in these twelve stories reveal what their hearts and souls encounter in relationships. Their misreadings, mistakes, and misadventures bare what happens to people who love another. Lowenkopf’s The Fiction Writer’s Handbook is the definitive volume to explain the words and phrases that writers and editors use when they talk about a work. The book helps new writers who need an understanding of the writing process, and seasoned writers can dive into a refresher course with new angles. That came from Lowenkopf teaching in the Master of Professional Writing program at USC for 34 years. He is currently Visiting Professor at the College of Creative Studies, University of California at Santa Barbara. White Whisker Books is a small press with four authors based in Los Angeles. To see more of what it offers, go to www.WhiteWhiskerBooks.com. Its books are distributed by Ingram.